Email me to chat about SIRVA. My “it’s worth a try” series is just a bunch of rambling about things I’ve tried (that are free, for the most part) to improve my situation while stuck with a Shoulder Injury Related to Vaccine Administration (SIRVA) for however long it takes to resolve (hopefully, for you, a short time). The whole idea of “it’s worth a try” is that it probably won’t hurt anything, and may help, so why not? The first post was all about immune system support through things like diet and exercise. The second post was a clumsy attempt to describe what I’ve learned about the struggle of having a depressing hardship like a debilitating injury, and the things I’ve tried to help deal with it. Of course, this experience is more or less universal (almost everyone gets ill or injured at some point in their lives, some much worse than others) but I’m just throwing my observations out there into the digital pile. In the second post I talked about picking up a new hobby, running, which just led to knee pain and more bills, PT, and despondency (although at least that injury is one I caused myself, instead of one caused by someone else’s incompetence, like SIRVA). For me, the theory behind running to help with SIRVA is that pumping the arms in a range of motion that wasn’t too painful would help keep things moving, improve blood flow, and maybe (long shot, but worth a try!) help my shoulder heal faster. Along the same lines of bone healing, one of my doctors recommended this program to me: osteostrong. I went to the two free sessions at a place near me and didn’t continue after that, because it is expensive, but the theory is very interesting, and because it came recommended by a doctor, it feels like it has some legitimacy (?). I hope biking covers the same category of weight loading on the humerus. Now I just have to make sure I don’t get injured biking….! One other “new” hobby I picked up after getting SIRVA was art. If your dominant arm is your SIRVA’d shoulder, this probably won’t work for you, and I am very sorry about that. But for me, I hadn’t done anything artistic since taking art classes in high school, so I looked at my local community college’s extension catalog and picked out a class in pastels. 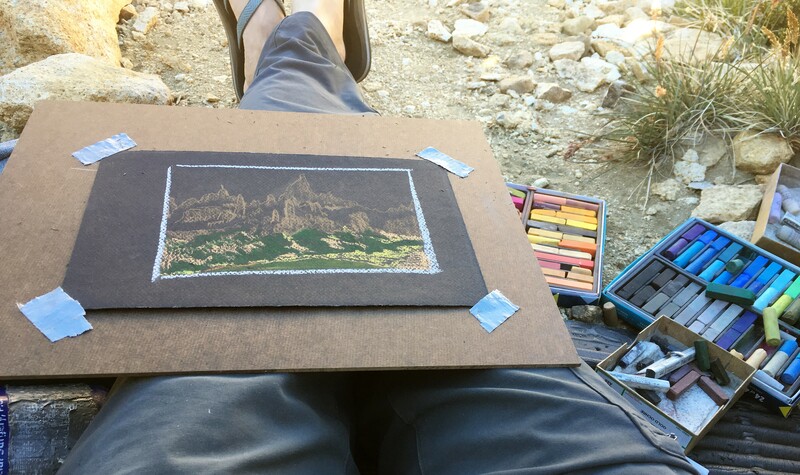 We spent a day in the classroom and a day sketching outside. I don’t think I’m at all talented, but it doesn’t matter—it’s a form of personal self-expression (even if it looks “ugly,” it’s what I wanted to express), it’s enjoyable to do, it can maybe even be therapeutic. In my case, it also gets me outside (all I want to draw are landscapes). Sometimes you have to bundle up to go sketching outside. 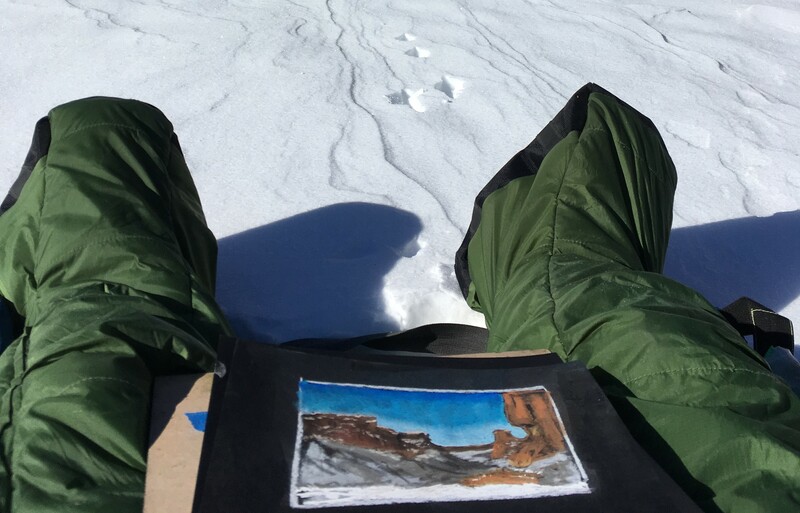 This would be “extreme” plein air sketching in my Selk’bag. 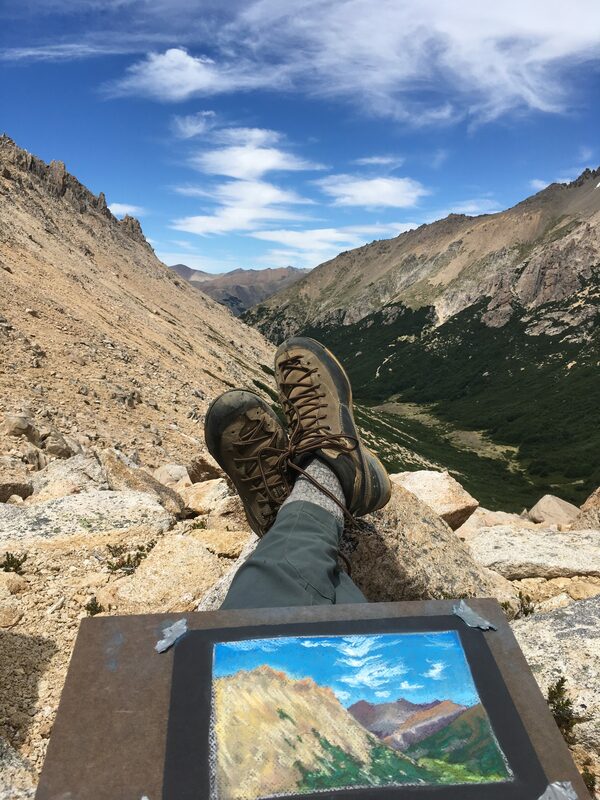 So far I have used art as a tool to get out to the same beautiful places as my partner and friends, and then I just go off and sketch while they climb or do whatever active things I can’t do right now. I love it, and I look forward to getting out sketching. 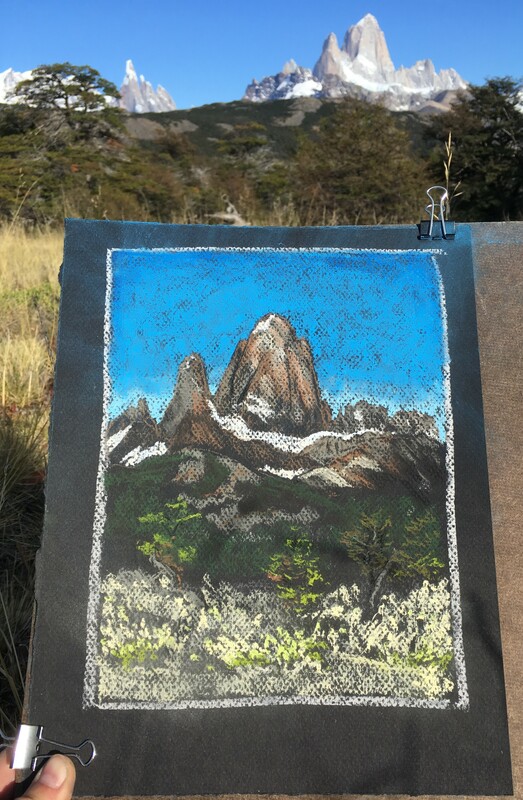 In fact, I was just in a cold, rainy, beautiful place on vacation, and I was itching to get outside to draw even though the weather was foul. I went out and sat under a bridge to avoid the rain and sketched until my fingers were too frozen to work anymore. But otherwise, I stick to sunny days and beautiful scenery, and draw my heart out. The other “hobby” I picked up is making webpages, like this one, and another one that plots and tracks snow data from year to year. Forcing myself to learn new skills is challenging and ultimately very rewarding. I wouldn’t have made either webpage if the injury hadn’t driven me inside on all those weekends last year, so there is that I am thankful for. The bottom line here is that it is probably hard for any of us to see any “silver linings” come out of having SIRVA, but at least I hope I can look back at the new things I tried during that time and say that maybe I’m glad I had the opportunity and motivation to try them, and that my life is enriched for having done so. And I chose some of these things because I thought they might help with either the physical or mental aspects of dealing with injury, for which I say, if it’s not going to hurt something, then it’s definitely worth a try.